How It’s New York: The show is happening at New York Theatre Workshop, one of New York’s premiere development sites– Rent started here. And, just got word last night that Once the musical is moving to Broadway. How It’s Irish: It’s set in Ireland, of course, and the pub setting with music has an Irish flavor. This piece about the atmosphere of Once was originally published in Wall Street Journal’s Speakeasy blog. The cast of “Once” at New York Theatre Workshop. Used to be, you couldn’t take your drink to your seats at the theater. At “Once,” the musical based on the 2008 film which opens Tuesday night at New York Theatre Workshop, not only can you take your drink to your seat, it’s for sale onstage before the show and during intermission. And there’s not just entrance music, there’s an entrance jam going on as the audience enters. While actors sometimes play instruments (John Doyle had them do it in “Company”) here the surprise is when the musicians morph into actors. You can’t fake the fiddle. In the program the actors are listed by their role, when in fact it’s often easier to think of the guy with the cello, or the drum player. “Once” is a bittersweet love story about an Irish busker and a Czech musician who touch each other musically but stay apart romantically. The film featured music and lyrics by Glen Hansard and Markéta Irglová, and “Falling Slowly” won the Academy Award in 2008 for Best Original Song. Music from the film is in the stage musical, sung by the two leads, Steve Kazee as the Guy and Cristin Milioti as the Girl. But they rarely sing alone. In film, an unseen orchestra sometimes provides underscoring, but in “Once,” the musical, the orchestra is onstage and part of the action. The audience is also part of that action, particularly during intermission, when the set of the bar becomes the stage bar. For sale is red wine (a shout-out to a character who drinks red wine), Harp Irish Lager and Guinness. While the drinks are poured, musicians continue to jam. 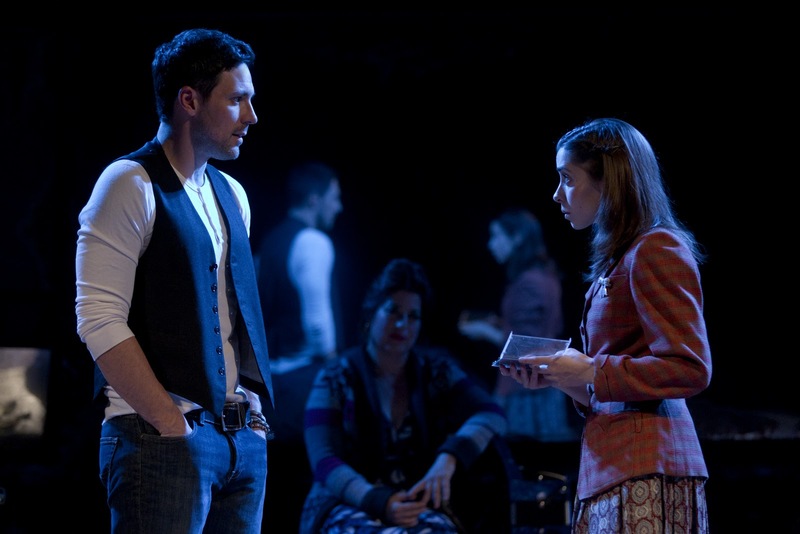 “Once” is being performed at New York Theatre Workshop until Jan. 15. The best Times Square pub, bar, restaurant and carvery in Irish area. All men and women are most welcome in the moment or for hours where they can get generous drink.